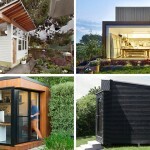 Today we’re sharing 14 examples of backyard offices, studios, exercise rooms, and hideouts that take backyard sheds to a whole new level. 1. Clad in black timber, this backyard guest house is just the right size for a visiting friend or family member. 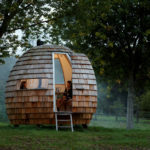 It features a number of windows that help keep the tiny home naturally bright and ventilated, as well as some closet space for people who are staying a little bit longer. Martin Kallesø designed this modern guesthouse. 2. Tucked into the back corner of this backyard sits a small studio home office covered in charred wood siding. Sett Studio designed this backyard office. Photography by Blake Gordon. 3. This light wood studio in the backyard of a Brooklyn townhouse features a small green roof and a skylight to make the city-escape feel brighter and more connected to nature. 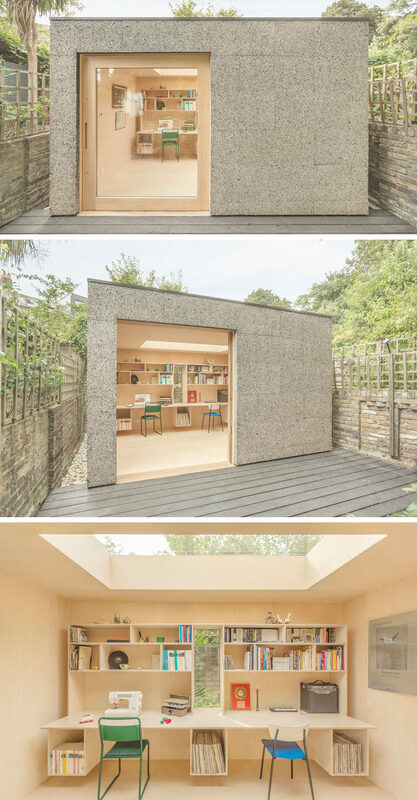 hunt Architecture designed this garden studio. Photography by Brian Ferry. 4. This backyard studio was created to serve as a secluded spot where people can go to paint, sculpt, and take care of orchids. First Lamp designed this backyard art studio. 5. Black stained cedar and natural pine plywood make up the exterior and interior of this writers shed located on a concrete plinth in the backyard of a townhome. Designed by Architensions. Photography by Cameron Blaylock. 6. 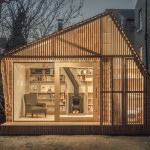 This sculptural backyard structure is made from wood panels that curve around each other to create a backyard office as well as a storage space for extra garden things. Designed by Platform 5 Architects. Photography by Alan Williams Photography. 7. This slightly sunken backyard gym covered in charred cedar, while the interior is covered in birch panels with a mirrored wall on one end to brighten the space, make it feel larger, and let people who are exercising check their form. Designed by Eastwest Architecture. Photography by Naaro. 8. 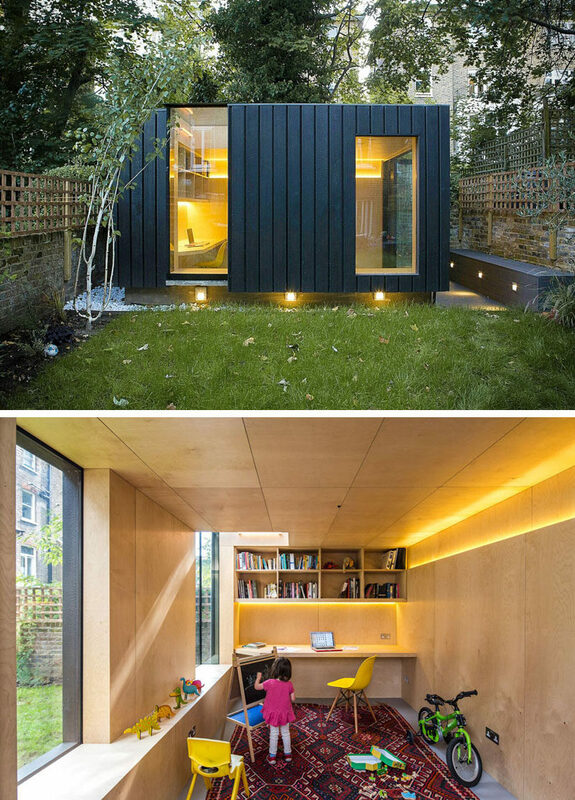 This charred cedar clad studio was added to the backyard of this London home to provide an office, a yoga studio, and a children’s play area. Designed by Neil Dusheiko. Photography by Agnese Sanvito. 9. Cork cladding covers the exterior of this backyard work shed to reduce the impact on the landscape, insulate the shed, and provide protection from the elements. The birch plywood interior of the office is made extra bright by the large skylight in the middle of the roof. Designed by Surman Weston. Photography by Wai Ming Ng. 10. This small guest house was prefabricated before being put together in the backyard of this home and features a kitchen, bathroom, dining spot, sleeping area, and desk space. Avava Systems designed this modern guest house. 11. 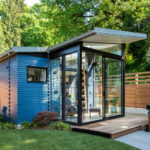 This backyard shed was created as a multi-functional space detached from the home that could be used as a storage shed for tools and bikes, a bright private office, or a temporary guest room. Designed by Serge Schoemaker Architects. Photography by Raoul Kramer. 12. 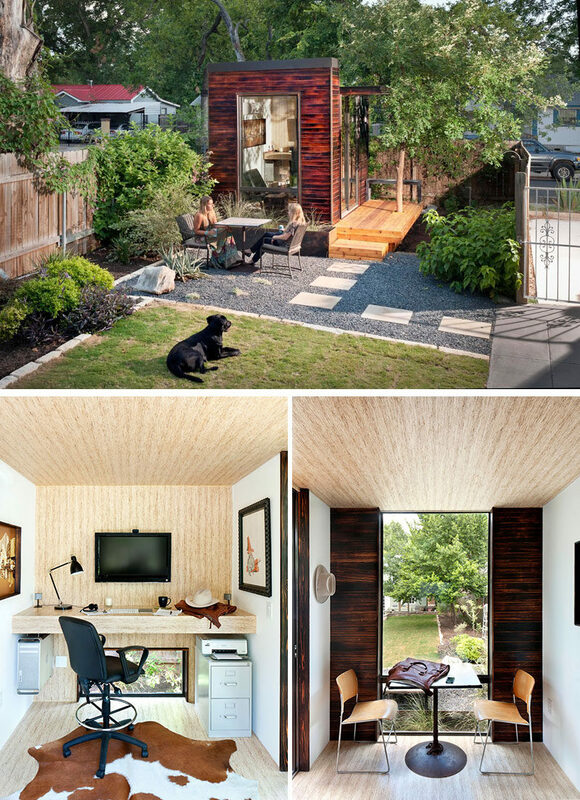 This prefab backyard home office is covered in wood and black trim surrounds the windows and sliding door. 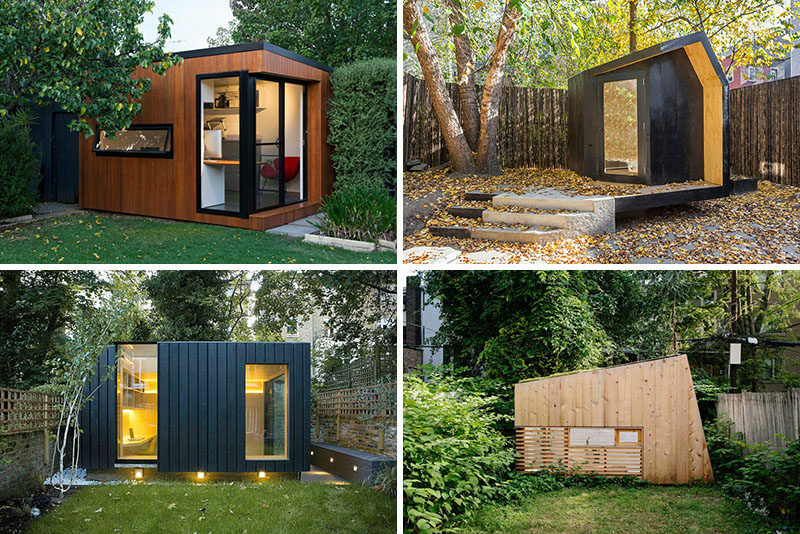 Inoutside designed this prefab backyard studio. Photography by Brad Griffin. 13. This small backyard studio has been carefully designed to accommodate a couch, a work space, and a lofted sleeping area to create the ultimate backyard hideout. 14. 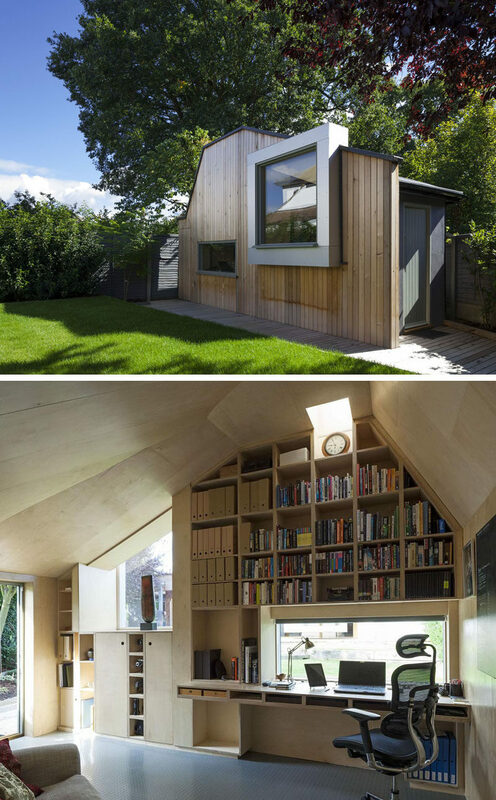 This modern backyard home office for a writer was built to replace an old garden shed. Designed by Ashton Porter Architects. Photography by Andy Stagg.